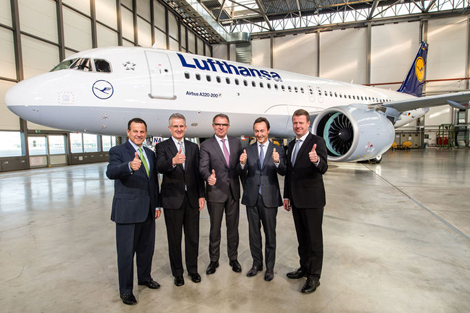 Lufthansa has made history by taking delivery of the world’s first Airbus A320neo (new engine option). The fuel-efficient aircraft is equipped with the Pratt & Whitnet Pure Power Geared Turbofan engines, which reduces emissions and noise as well as burning 15 per cent less fuel than the current generation of the A320. The Lufthansa Group has a total of 116 A320neos on order, which are intended for its main carrier as well as Swiss. The aircraft will have a total of 180 seats, and offer both business and economy class. Further details have yet to be revealed about the seating configuration. The galleys and lavatories in the front and back of the aircraft have been arranged in a way to allow a more efficient use of space: business class passengers seated in the front rows will experience greater legroom, while the airline has managed to fit an extra two rows (or 12 additional seats) in economy. Lufthansa will deploy its new aircraft on flights between Frankfurt and Hamburg from January 24. This will be followed a Hamburg–Munich route. “Today we prove once again that as an aviation company and airline group we are pioneers in the development and introduction of technical innovations. In this year alone the Lufthansa Group will receive a total of 52 new aircraft, a number we have not received in years”, said Carsten Spohr, chairman of the executive board and chief executive of Deutsche Lufthansa AG.